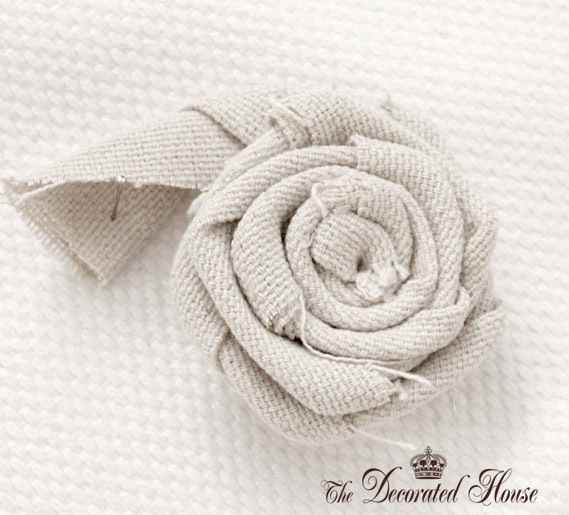 How to Make A Rosette Fabric Flower. by the readers of The Decorated House. After posting my Valentine's Day Pillow, several people asked how to make the flowers. So here is a little tutorial for the basics and some different variations with step one: The Rosette. 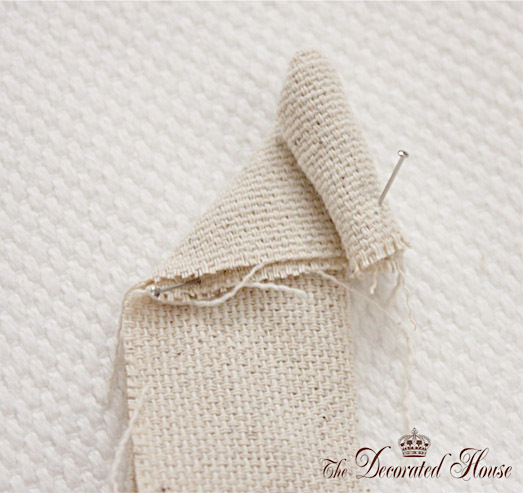 Then fold and roll the edge under. Put a tab of hot glue or fabric glue to keep it in place. it like I am doing here. I tie a knot when I'm using ribbon. (Some people do not fold their fabric. Now fold the long strip away from you. the center to make the flower. fold it towards them. Either way if fine. Just keep doing the fold in the direction you start with. You will get your own rhythm to the twist and turn. it towards the flower to smooth it out. You'll see this as you go along. Add a little bit of hot glue as you go along. As you twist and roll, it gets bigger, and it can be whatever size you want. 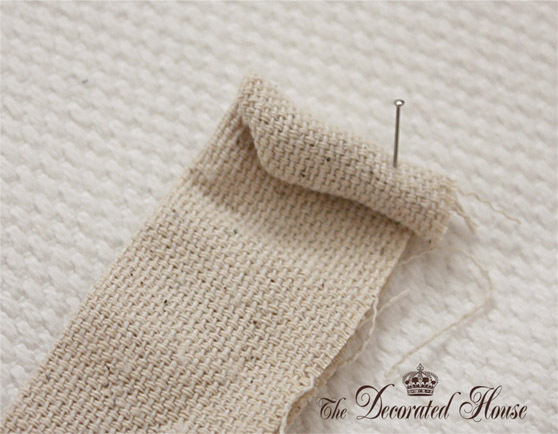 The length of the fabric will determine the size for your rosette. When you make it the size you want, tuck the end under and glue it. 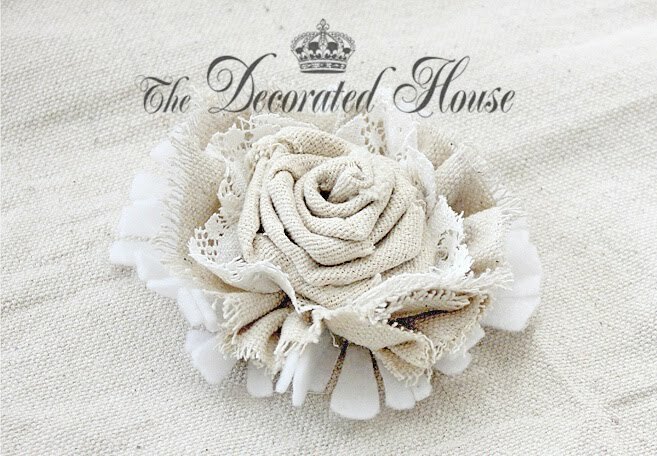 You can cut a small circle of fabric ( I like felt because it won't unravel) and glue the rosette to the circle. It's a nice finishing touch. and each one is kind of unique according to how you twist and turn. while looser twisting and rolling will give you larger petals. This is the Rosette ready to use alone or with other elements. and then some other versions for you to try! Thank you I have been wondering how to make these. Off to find some fabric now to try. Thank you for sharing this lovely instructions on making the flowers. I am going to try this ASAP...kind of you to share. This is great! I love fabric roses! I can't wait to try it. Excellent tutorial, thank you. Julia C.
Beautiful flower.. tutorial is awesome too. On my post I've added a link to your blog, so my readers will know that they were made with your tutorial. Thanks again!! Thank you for the tutorial Donna! Good Afternoon Donna, I have popped by to visit you as you were recommended by Marisa at Passion et Couture. I am so pleased she did as these flowers are so lovely. I love the use of fabric and lace.... Just so beautiful. 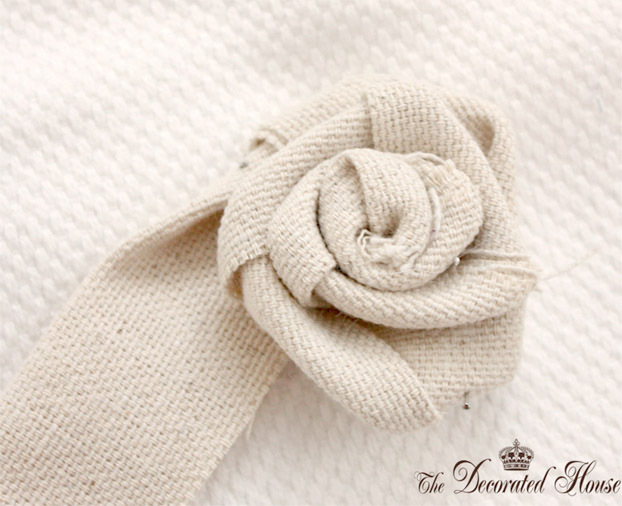 I am going to follow your tutorial and make a fabric flower. 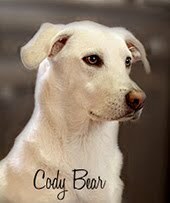 I have really enjoyed my visit and I have become a new follower. I am looking forward to catching up on your other posts. I would like to invite you to visit me at Ivy, Phyllis and Me! The front door will always be open to you. Thank you so much for making this tutorial!! I have always wanted to learn how to make these!! They are gorgeous!! 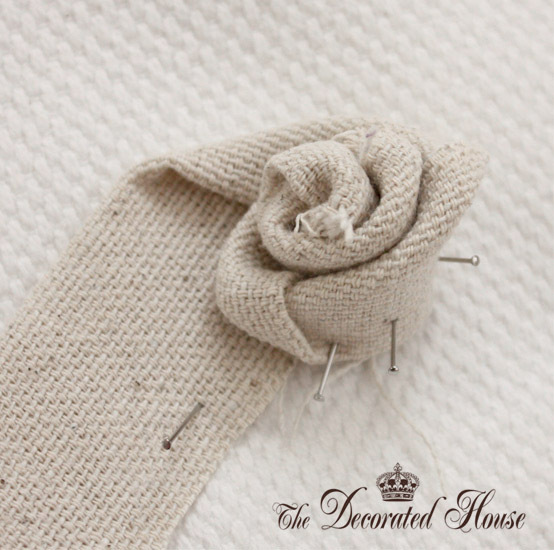 Thanks so much for sharing this tutorial, but now I am dying to try to make the first rose at the top of the page. You said you have links for that rose, and some others to try, but there are no links to that tutorial, and a search of your blog doesn't show them either. Have these tutorials been removed? I really hope not, as I was wanting to try to make the first one. Would you consider restoring these posts? Thanks so much for your generosity.